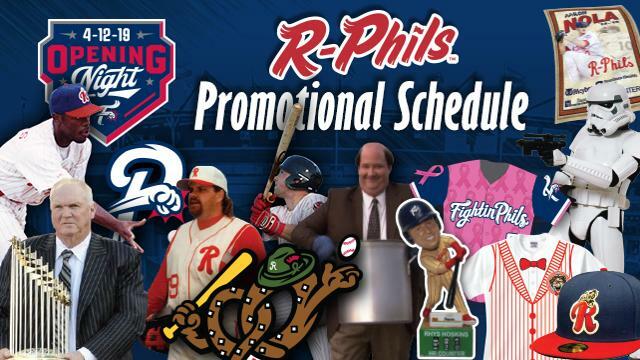 The Reading Fightin Phils on Friday announced their primary slate of promotions for the 2019 season. Come welcome in the 2019 Reading Fightin Phils as the team kicks off its home schedule at FirstEnergy Stadium on Friday, April 12 at 7:10 p.m. The first 3,500 adults in attendance will receive an Aaron Nola R-Phils fleece blanket, perfect for those chilly early-season nights. Carpenter MEGA BLAST Fireworks: The largest fireworks shows in the history of FirstEnergy Stadium! Baseballtown Hall of Fame Induction: On Tuesday, August 6th the Fightins will honor former R-Phils shortstop Jimmy Rollins with an induction into the Penn State Children's Hospital Baseballtown Hall of Fame. The 17-year Major League veteran and former MVP played for the Fightins in 1999. The first 3,500 adults take home a Jimmy Rollins sliding bobblehead. Mother's Day/Breast Cancer PINK OUT: On Sunday, May 12th Fightins players will be wearing special custom jerseys, with each featuring the name of someone who has battled breast cancer. With a group purchase of 20 or more, fans can have their loved one's name displayed on the back of an in-game Fightins jersey by signing up at https://www.milb.com/reading/forms/pinkout. The first 1,500 women in attendance will also receive a PINK OUT for breast cancer carry bag. All fans are encouraged to wear pink in support. Veterans and Active Military Tribute: Tuesday, July 2nd will serve to salute veterans and active duty military. All veterans and active military get in free, and fans have the chance to honor their favorite military member by having their name featured on the back of a Fightin Phils jersey. Each Fightins player will be wearing one of these custom jerseys in-game. Groups of 20 or more have the opportunity to sign up at https://www.milb.com/reading/forms/military2019. Gluttony Night: Bring your appetite on Tuesday, June 11th - It's All-You-Can-Eat at the concession stands from 5-9 p.m. for only $9 when purchased in advance. Harley Night: Saturday, August 17th is the 22nd annual Harley Night. The first 2,500 who are at least 18 years of age receive a Fightins Harley Game Cap. Plus, enjoy post-game fireworks. Harry Potter Tribute: Saturday, August 3rd and Sunday, August 4th it's Harry Potter weekend, with Hogwarts jerseys and hats, a game-worn jersey auction, quidditch clinic, and a Harry Potter tribute scarf giveaway on August 4th. Pride Night: On Wednesday, August 28th, the first 1,000 fans receive an R-Phils rainbow bracelet. Sandlot Movie Tribute: On Saturday, April 13th, the first 750 kids receive a Sandlot-style extended-bill hat. Star Wars Tribute: Star Wars Weekend takes place June 8-9th. A Star Wars-themed Carpenter MEGA BLAST Fireworks show follows the game on June 8th, and the next day kids will receive an Aaron Nola "Master Nola" Strike Out Tracker Bobblehead. Join Star Wars characters for a photo session beginning at 3:30 p.m., and stay after the game for a viewing of "The Last Jedi" on the field. The Office Night: Sunday, June 30th is The Office Night with a special appearance by Brian Baumgartner, aka "Kevin Malone." Autograph and photo sessions will be available, as well as "Kevin Malone" VIP Meet & Greet tickets for $75, including a limited edition "Kevin with his famous chili" bobblehead.